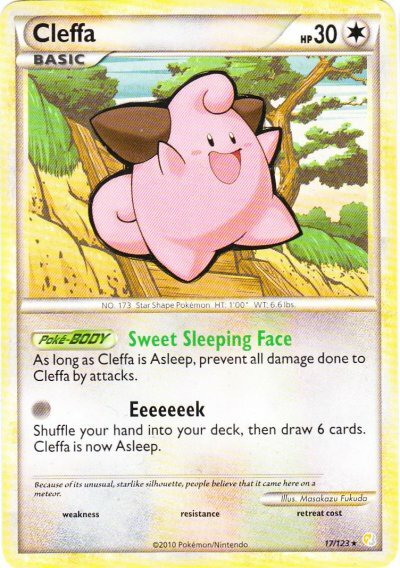 Cleffa is a staple or at least a “one-of” card in almost every deck right now. It is a card that works in any deck and is a solid starter, mid game refresh or late game stall. I played a Battle Roads this weekend (I went 1-4, but a fun Battle Roads none the less) where in four different games a prize was taken because I used Cleffa. The way each of these prizes were taken was with Catcher. I had used Cleffa as an early set up, retreated it for a heavy hitter and then late game they caught it up and took the easiest prize possible in the format. Coming back from being a prize down is no exceptional feat and something you should plan on having to do in a deck. Only once did I lose the game because of this play. I finished a Battle Roads today (went 3/3) where I played with many different players. Of course everyone reacts differently under stressful situations, like meeting new people or confronting them competitively, but how you deal with your opponent on a social level very much contributes to how much you enjoy the game. The overall goal of the TCG and the VGC is simple, have fun. That was the original idea when developing them both and perhaps the idea that we need to focus on the most. I finished playing at league yesterday and realized I was playing decks that were printed offline. I played two match ups against two different players with almost identical decks. Another player playing the deck that dominated the top 8 at worlds and finally a player who ran a slight variation of a deck list I built after the Emerging Powers release. These players have developed the easily acquired talent of net decking. They use the online power of Google to discover the deck they think most likely to win at a Battleroads. They build it, they play it, and I would imagine they feel great winning as most people would. Anyone can do this. My eight year old cousin could build Beartic/Vileplume not because he has a strategic mind or he is some sort of Pokémon savant but because he is smart enough to use a computer. There are two different things that challenge a player in a deck building game, the ability to win and the ability to be creative. Unfortunately winning is more easily acquired and does not frequently match up with a creative mind. For me, the fun of the Pokemon card game doesn’t lie in winning the world championships or having a great record. I would rather lose nine out of ten games and win that one game with a crazed combination of Pokemon no one saw coming. I challenge you to use a net deck list not to build a winning deck but to build a better one. These cards are good for a reason, understand that reason and use it to build a deck that is new and exciting. The world of Pokemon is vast with options that people over look. Find them, exploit them and win with them.